Incredibly, while this bridge has not one, but two very concise and intricate rituals associated with it, the background story (i.e. : why the bridge is haunted) is pretty much non-existent. By and large, most simply wrap the bridge in with the entire Gore Orphanage legend and mention it being haunted by children who died in the orphanage fire. If you want to have a paranormal experience on this bridge, you best be ready for a workout. And get this; you get to choose from 2 different rituals! Drive up onto the bridge, park, then turn the engine off and exit the car. Then, take a little stroll. In some versions, you just have to walk off the bridge while others have you walking down Gore Orphanage Road a short distance. Either way, you’ll know you’ve walked far enough when you start to hear what sounds like a crackling fire, followed by the screams and cries of little children. That’s your queue to truck back to your car. But get this; you won’t be able to start the car until you physically push it completely away from the bridge. For this ritual, you might want to bring along a spare set of keys. That’s because you’re supposed to park your car in the center of the bridge, then turn the car off but leave the keys in the ignition. Once you’ve done that, get out of the car and lock the keys in the car (now, aren’t you glad I told you to bring a spare set) and walk off the bridge. Keep walking and you’ll suddenly hear your car start by itself. But don’t go running back just yet, because if you hang tight, “unexplained lights and ectoplasm may materialize around you.” Upon returning to the car, you might also find children’s handprints all over it. Located around the 9600 block of Gore Orphanage Road. 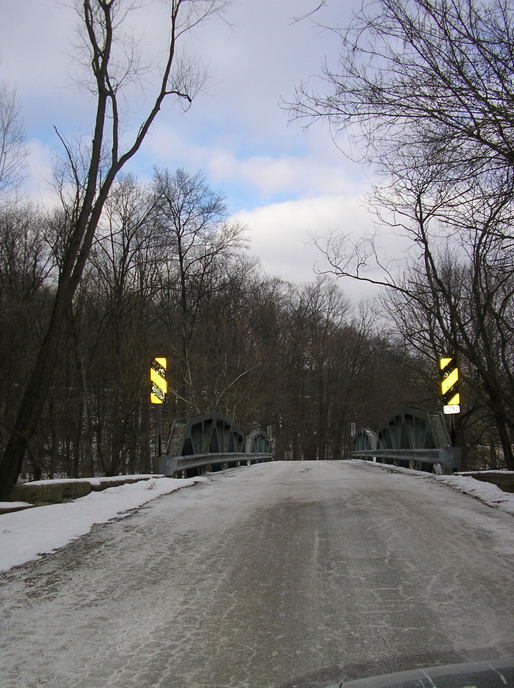 The bridge is traditionally listed as being in Vermilion. However, the bridge straddles the Vermilion River, which creates a natural dividing line between Vermilion and Amherst. I have a strong connection with this particular bridge. I’ve been visiting the Gore Orphanage site since 2000 and, as such, have crossed this particular bridge many, many times. What I find so fascinating is that I don’t recall hearing any ghost stories, Crybaby or otherwise, about this bridge until 2008. I even used to joke with people and tell them “just give it time and this bridge will become a Crybaby Bridge.” Turns out I was right…for once. It’s interesting to note that although this bridge is always referred to as a Crybaby Bridge, none of the legends associated with it mention a baby crying. Instead you are supposed to hear the “screams and cries of young children” as they are being burned alive. And in fact, in one version of the legend—the one containing Ritual #2—you don’t get to hear any crying at all! I also find it interesting that many aspects of the Gore Orphanage legend—hearing a phantom fire, ghostly children, phantom handprints on your car—have been incorporated into the bridge story. As someone obsessed with urban legends and how they mutate, this suggests to me that the Gore Orphanage legend, or at least parts of it, have “jumped” from their original location down to the bridge. This happens quite frequently, especially in cases where the original location is no longer accessible or, as is the case with Gore Orphanage, the authorities are discouraging people from visiting. Of course, since people are finally accepting the fact that the actual location of the orphanage was closer to the bridge (as opposed to the foundation further down Gore Orphanage Road, which is actually the remains of the Swift Mansion), it only seems logical that the ghostly children would choose to hang around the bridge once the orphanage closed down since it was the only remaining structure in the area, right? Well, not really. The problem with that sort of logic is that the bridge is listed as having been built in 1956, decades after anything resembling an orphanage closed down. But then again, when have we ever let the facts get in the way of a good urban legend? While we’re on the subject of “facts”, I guess now would be a good time to point out a rather misleading web site I came across while gathering information for this page. The site, History Of Gore Orphanage, contains many different aspects of the Gore Orphanage legend, including stories concerning the bridge. However, while the site contains a list of “Myths of Cry Baby Bridge” and presents them in such a way as to imply they are associated with the Gore Orphanage Bridge, they are not. In fact, a quick check of the page’s citations, which the author deserves a pat on the back for including, reveals that all of the myths are attached to other bridges, none of which are even in Ohio. The site further confuses things when it adds the idea of “sprinkling baby powder on the bridge” in order to have “baby footprints” appear to the ritual. All of the other parts of the ritual listed on the site are ones associated with the Gore Orphanage Bridge, but the baby powder/baby footprints is not. That particular aspect of the legend was lifted from a legend associated with a Crybaby Bridge in Bowie, Maryland (read about it here). My apologies to the person who created the Gore Orphanage site. I’m really not trying to bash you. My only reason for pointing out the misleading information on your site is simply to point out that trying to track these legends within the state of Ohio is hard enough. We don’t need to start mixing in stuff from other states! The bridge on Gore Orphanage Road is no joke! We weren’t even out of the car and we heard what sounded like a scream coming from the woods. We walked a little bit off the bridge and started to climb under the bridge when something went running out the other side. My friend swears it looked like a little kid. I didn’t see anything but I can tell you what I heard was not an animal. The running sounded just like a little kid would make. Went there twice and nothing happened. Seems like something a bunch of bored teenagers made up for something to do. Spooky bridge, though. Me and some buddies went to this bridge because the one guy told us all kinds of creepy stuff would happen. Well, he was wrong because we were there for like an hour and nothing happened. Maybe it was because we didn’t lock our keys in the car or whatever but there was no way we were going to do that. South Carolina Tales: The REAL Crybaby Creek Bridge.